Kitchen herbs or a showy petunia, this little burro is ready to carry the load. 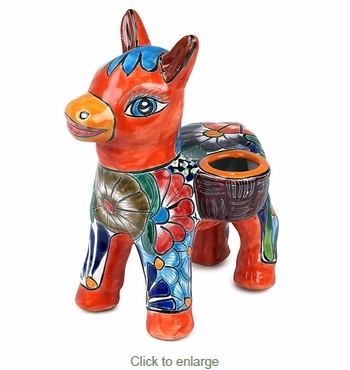 Perfect for the kitchen counter or as a centerpiece at your next fiesta this burro is handcrafted by the talented artisans in Mexico and eager to be a part of your collection. Traditional Assortment: The design shown is of the Traditional Talavera style. Your burro pot will be chosen from our current assortment of available colors and designs. The item you receive will likely be different than pictured here.